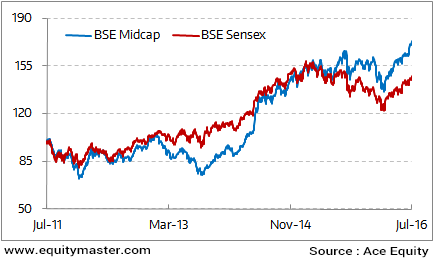 Home > Share Fundamentals > Share Investment - Will Midcaps Continue to Outperform? Share Investment - Will Midcaps Continue to Outperform? Will Midcaps Continue to Outperform? As the chart shows, started around March 2015. When the Sensex failed to decisively break past the 30,000. Since then the benchmarks have languished. But the action has clearly shifted in favour of midcap stocks. Now this can be seen as something that is perfectly normal. But it does cause us a bit of worry. Usually, when mid and smallcaps outperform it's a clear sign of retail-investors entering the markets in large numbers. They tend to speculate and trade in and out of stocks where the fundamentals are questionable. Of course we don't want to generalise but if the past is anything to go by, then this should be a time for caution... and not a time for aggression.